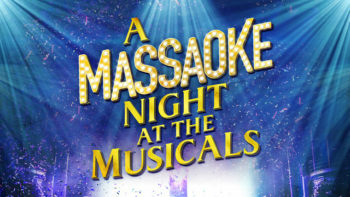 A Massaoke Night At The Musicals is what it says on the tin. A mass audience karaoke, singing musical theatre songs with a live band playing all your favourite hits at Camden’s coolest club KOKO. This is the very first show of its kind, guided by giant video lyrics, as they raise the curtains on all the hits from the most well-loved musicals. Shows will include Mamma Mia!, Grease, Frozen, Dirty Dancing, Phantom Of The Opera, The Greatest Showman and many more. The atmosphere is electric from the moment the live band comes on to the stage in this glorious old theatrical venue. Each member of the band is dressed as a different character from a musical and creates an eclectic mix of characters delivering all your favourites from the most loved musical theatre shows. The best bit about the evening is that WE, the audience, are the stars! People in the audience/crowd wore T bird tee shirts from Grease, had Phantom of The Opera face masks, props such as the French flag (representing Les Miserables) and many more . . . the effort that some people had put in to this was off the scale and aided in creating such an incredible evening. It’s important to note that although the audience sing their way through the evening it’s the singers, who all play instruments and make up the band, that are the real stars! It must be an unusual performance for the band as the audience are more interested in their own vocal shows between friends than what is happening on stage but each and every member of the band/singer delivers outstanding performances geeing the audience and guiding us on our wonderful musical adventure! Be warned; this isn’t your traditional night at the theatre and is more like a gig than a ‘show’, you’re stood up the whole evening, but if that’s your thing and you’re a big fan of musicals or looking for a special night out to mark a celebration (birthday, hen doo, work party) then this night is for you! This is definitely an experience I won’t forget in a hurry . . .